Charles Elliott Roberts in unique among the early African American students at Massachusetts Agricultural College in not being from the south. Although comparatively little is known about him, Roberts was probably born in Bellows Falls, Vermont, on Mar. 21, 1887, one of at least seven children of Perry Roberts (born in Maryland in Apr. 1862), a janitor at the Society House in Amherst, and Ella Eunice (Brooks) Perry (b. Apr. 1865), who was listed as having a French Canadian mother. The family lived in a small African American enclave at 62 Hazel Ave., immediately below the present-day Amherst College football fields (1). 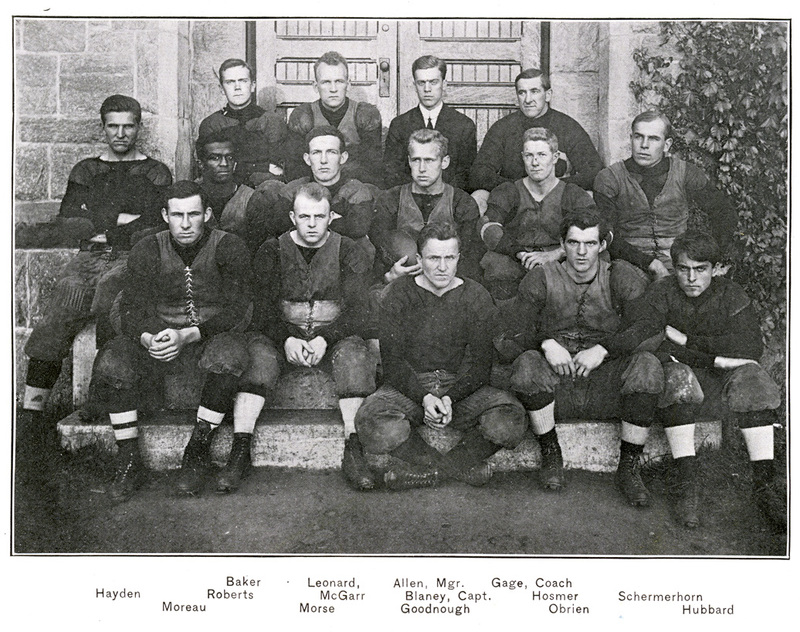 Listed as a freshman in the Class of 1911, Roberts played fullback on the football team in 1909, taking most of the kicks and becoming one the team's most consistent players, though missing the key matches against Williams, Brown, and Springfield in late October and November due to a wrenched knee (2). Despite missing nearly half the season, he was cited in the student newspaper as “good at both offense and defense” (3). During the winter, he ran track on the college's successful relay team, where he “showed excellent form and speed” (4). Roberts apparently left school in 1910 without completing his degree. In the U.S. Census for 1910 he is recorded living at home with his family on Hazel Ave., and is listed as a journeyman working with a clothing firm, not a student. His whereabouts thereafter are uncertain, although when registering for the draft in 1918, he reported that he was married with one child, and was working as Athletic Director at Lincoln University, maintaining the strong connection between early African Americans graduates at MAC and Historically Black Colleges. The last record for Roberts comes from the Census of 1920, when he was working as a machinist in Buffalo, married to Ida (Mulatto) age 30 from Georgia (5). Roberts died in 1951 and is buried in West Cemetery in Amherst near his parents and brothers Perry E. (1889-1908), Harry R. (1890-1907), Robert G. (1896-2002), and Frank (1898-1986), and sister Anna E. (1892-1931).